AXI Fine and Water Block Filters are the most efficient, reliable, and cost effective filtration products on the market. For a diesel engine fuel filter to remove contamination from the fuel system, it must be very efficient, ideally below 4μ. The efficiency of a filter is reported as a Beta Ratio and is the recognized industry standard for reporting filter efficiency. The Beta Ratio is defined as the difference between the number of particles larger than a given size upstream of a filter to the number of particles of the same size downstream of the filter. 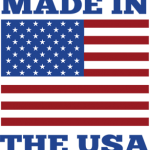 More can be learned about filter standards and efficiency at our Diesel Engine Fuel Filters page. AXI Spin-On Fine Filters range in filtration from 25μ down to 1μ. 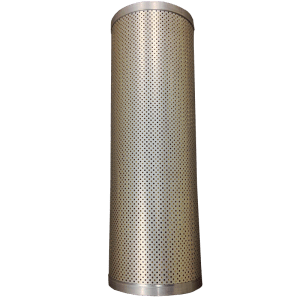 These filters will remove the smallest of particulate from fuel, providing superior contamination protection and reliable engine operation. The Fine Filters are easy to install and change, leading to little downtime. AXI Mobile Fuel Polishing Systems, Automated Fuel Maintenance Systems, and Enclosed Automated Fuel Maintenance Systems are the product series AXI offers that utilize these Fine Filters. Below is an AXI Filter Replacement Chart to aid in determining filter configurations. 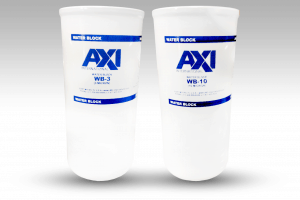 AXI Water Block Spin-on Filters trap the water out of fuel as it passes through the filter. Water Block filters are available in 10μ and 3μ, as shown on the Filter Replacement Chart. 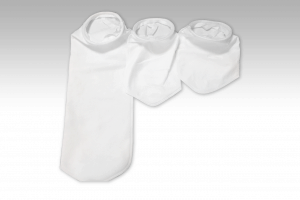 AXI Bag Filters are used on Pre-Filter Vessels and Mobile Fuel Polishing Systems. Filtration options include 5μ, 10μ, 25μ, 50μ, 75μ, 100μ, 150μ, 250μ, and 800μ, as shown on the Filter Replacement Chart. The AXI Bag Filters are very convenient and cost effective, sparing the more costly Fine Filters from excess stress and clogging. 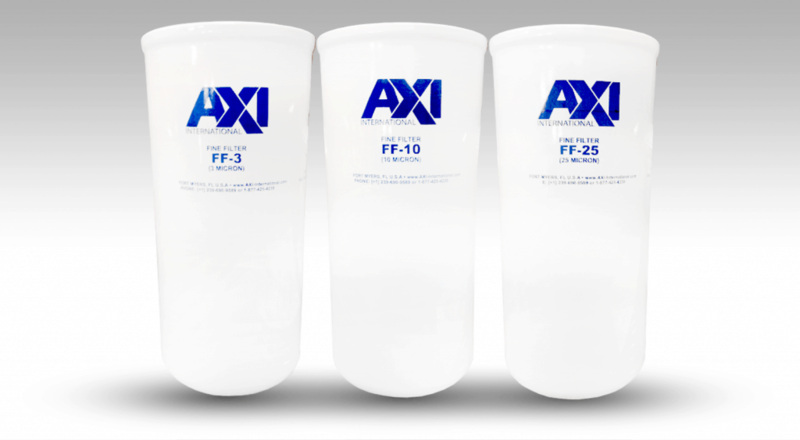 AXI Fuel Filter Cartridge options include 30μ, 10μ, 7μ, 3μ, and 2μ filtration. Water Block Cartridges are available in both 10μ and 3μ filtration.